The costs of military operations in Afghanistan and Iraq this year are likely to almost double to £3.297bn, a committee of MPs has warned. The Commons defence committee said operational costs for this financial year were now forecast to reach £3.297bn - a 94% increase on last year. 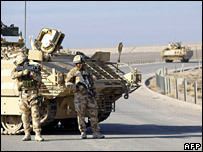 This included a 72% rise in spending on Iraq to £1.648bn, despite ongoing falls in troop numbers. The government says the money is needed for force protection. Last year's total spending on the two conflicts was £1.698bn. The cost of the Afghan conflict would rise 122% to £1.649bn this year, the MPs said. While the committee recommended that the House of Commons should accept the estimates, it said the Ministry of Defence needed to provide more information on how the additional cash was being spent. Chairman James Arbuthnot said: "Few people will object to the investment being made in better facilities and equipment for our troops in Iraq and Afghanistan. "However, this estimate represents a lot of public money. The MoD needs to provide better information about what it is all being spent on." He told the BBC the rise was particularly surprising in Iraq "where we've been told we are drawing down the forces, so you would expect there to be a reduction if anything." Overall, the MoD has said it needs an additional £2.192bn for the current financial year compared with its previous estimate made at the end of 2007. The committee said it was concerned that the forecasts were "insufficiently robust". "While we accept the difficulty of predicting costs when operations are ongoing, the difference between the forecasts at the time of the winter and spring supplementary estimates appears unreasonably large," it said. Armed Forces Minister Bob Ainsworth told the BBC: "People understand that we are going to want to spend every penny that we can on force protection. "The enemy all the time changes its tactics and its capability and we have to respond to that. We have to try and keep our people safe and that's not cheap." There are still more than 4,000 British troops in Iraq. Last October Gordon Brown said the intention was to reduce that to 2,500, starting in the spring, subject to military guidance. But the BBC's security correspondent Frank Gardner said he had been told it was "highly unlikely" troop numbers would drop to anything like that amount. For the Conservatives, shadow defence secretary Liam Fox told the BBC: "When politicians say they are going to bring troops home that raises expectations in forces families and then not to deliver on them, I think, is spinning of the most cruel type." He said funding for Afghanistan must be put on "a more sustainable basis, and on less of an ad hoc basis than it is now." Liberal Democrat defence spokesman Nick Harvey said: "This clearly shows how the Iraq war is continuing to bleed our finances dry, leaving soldiers in Afghanistan overstretched and under-equipped."